Where will they shift the book reviews and articles and discussions to? Good luck with that Ms. Arana; it has been clear to the most casual observer that those sections of the WaPo are not really interested too much on "satisfying" their readers; at least those readers with niche interests such as book, visual arts, etc. Think more celebrity focus and you've got the Style section. A few years ago the decay of the Style section's coverage of the visual arts in the Post started under then Style's editor Eugene Robinson, and this blog is a historical record of the decay of that section in covering the arts, as well as some outright lies by its editors over the years about some of the issues raised over the years. In 2004 the Style section used to have one column a week to review DC area art galleries. 52 articles a year to review from a potential field of over 1,500 or so gallery shows. But 52 is better than nothing. The columns were shared by freelancers Jessica Dawson and Glenn Dixon, both ex-Washington City Paper writers. Then Dixon quit over some dispute with the Post and the art review column was reduced to twice a month. But we were told on Monday, December 27, 2004 that the Post had "decided to hire a second freelance writer to augment Jessica Dawson's 'Galleries' reviews." We're still waiting for that second additional freelance art critic. Instead, since then the Post has reduced its galleries' coverage even further. And it's not like we don't understand the economical reasons for this. With newspapers all over the nation slowly bleeding away readers each month, the end of the line is near for these major, once dominant moribund giants of the printed media. But what fires me up is when they still try to tell us that nothing will change and that they still "get it" as the Post's annoying radio ads proclaim. The family of Andrew Wyeth and the Brandywine River Museum invite the public to a celebration of the life and work of Andrew Wyeth, who died on January 16. This special event will be held Saturday, January 31, from 9:30 to 4:30 p.m. Complementary admission will be offered to all visitors today. 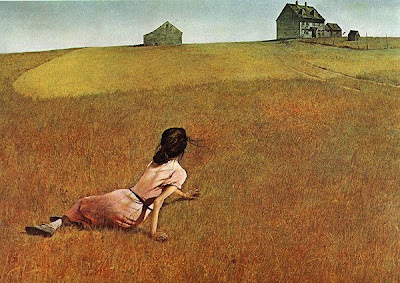 Andrew Wyeth's most famous painting, the iconic Christina's World, will be on view at the Museum for the celebration. * On loan from The Museum of Modern Art in New York, this is the first time the painting has been on view in the region. It is rarely seen outside New York City. The Brandywine River Museum currently displays 38 other paintings and watercolors by the artist. In addition to Christina's World, Wyeth's last painting, titled Goodbye, will be also on exhibition. The painting depicts a friendship sloop sailing out of the picture past an island with a single white frame building reflected in the ocean and in the wake of the boat. The painting was completed by Andrew Wyeth in Maine in 2008. "Andrew Wyeth once told an interviewer that 'Painting has been my one interest, nothing else but art,'" recalled Jim Duff, Director of the Brandywine River Museum. "The finest way to honor him is to enjoy the art he created." The documentary film, Self Portrait: Snow Hill, produced by Betsy James Wyeth and narrated by Stacy Keach, will be shown in the Museum's Lecture Room every hour on the hour starting at 10 a.m. Incorporating many of Andrew Wyeth's works of art along with family photographs, home movies, personal letters and footage of Andrew Wyeth, this moving program provides insight into his private world. In addition, memory books in which visitors can leave their thoughts will be located in the museum. The Brandywine River Museum is located on U.S. Route 1 in Chadds Ford, Pennsylvania. The museum is open daily, except Christmas Day, from 9:30 a.m. to 4:30 p.m.